Two new reactors have been approved to start construction in South Korea this year. Nuclear will continue its strong growth in the country, albeit under a less ambitious energy policy. An announcement from the Ministry of Industry confirmed the government's go-ahead for a plan to build two new APR1400 units at Shin Kori in the south east of the country. 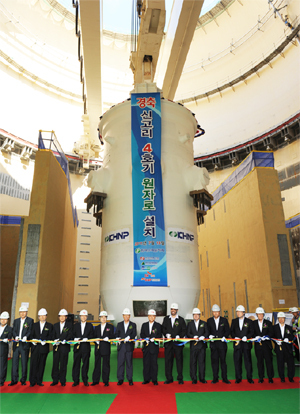 The reactors will be the fifth and sixth at the site and will come with a combined price tag of KRW7.61 trillion ($7.1 billion). Construction is set to start on Shin Kori 5 in September this year, with unit 6 likely to follow 6-12 months after. They are slated to begin generating power in late 2019 and 2020. South Korea imports some 97% of its energy resources at an annual cost of around $170 billion. It has a policy to reduce this figure, while establishing a reliable power system that reduces greenhouse gas emissions. This results in a set of capacity targets for its power generation fleet. The goal for nuclear power plants in 2035 is to represent around 29% of capacity, up from 19% now. To do this South Korea must build Shin Kori 5 and 6 as well as three further units - in addition to completing the five reactors currently under construction and continuing to operate the existing fleet of 23. This would result in a South Korean nuclear fleet counting 33 large reactors in 2035. This nuclear target actually represents a downward revision from a previous policy that would have seen nuclear power plants rise to make up 41% of capacity. However, the baseload role of nuclear power means that its share of production significantly exceeds its share of capacity: Today's reactors in South Korea are 19% of generation capacity yet their continuous operation sees them produce almost 30% of electricity. Other aspects of the new energy policy, brought in this month, aim to reduce coal and oil from today's 66% share to 52% by 2035, while meeting demand for electricity that grows steadily at around 2.5% per year. Renewables will go from about 3.6% to 5.5% of capacity while gas will grow from 12% to 15%. The revision of nuclear ambitions came as a response to corruption scandals in which cabling and some other components at some nuclear units were found to have been improperly certified. Parts were replaced at Hanbit (formerly Yonggwang) units 3, 4, 5 and 6 as well as Hanul (formerly Ulchin) unit 3. All these are now back in normal operation.